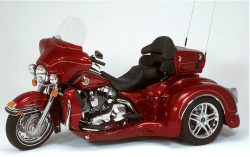 Beach Customs offers 2 trike conversion brands: Motorcycle Voyager and California Side Car. Beach Customs is an authorized dealer of both brands. We’ve provided you with some information below to help you decide which trike conversion is right for you. Feel free to stop by, or call and one of our associates will be glad to answer any questions you might have. If you live in SC, GA, NC, VA, DE, MD or PA call about bike pick-up for conversion. With a California Side Car Trike conversion from Beach Customs you can be sure you’re getting unparalleled performance with the most innovative and beautifully styled trike kits on the market. From the Sport, which set a whole new standard in the trike industry, to the newly released Custom Trike kit, which is truly the most innovative suspension and body design on the market, California Side Car Trikes continue to lead the way. Whether you’re cruising the interstate or tackling the curves, CSC Trike conversions inspire complete confidence in every type of riding condition. The installation hours will vary depending on which options are purchased with the kit. Contact us for more details. All CSC trike kits must be installed by an authorized factory trained dealer–like Beach Customs. IS THERE ANY WELDING INVOLVED IN THE INSTALLATION? No. It is a completely bolt-on installation. WILL A TRIKE KIT AFFECT MY FUEL ECONOMY? The impact on gas mileage depends on several factors, including the rider, style of riding, passengers or cargo weight, and geography. Some trike owners report negligible changes in fuel economy, while others may experience a 5-10% reduction. Order the optional Auxiliary Fuel Tank to increase your range. DO YOU OFFER DIFFERENT GEAR RATIOS WITH THE TRIKE KIR? No. SCS designed the kits with a specific gear ratio to achieve optimum performance and lifespan. HOW CAN I TEST RIDE A TRIKE BEFORE I BUY ONE? Check with us to arrange a demonstration ride. Also check the CSC Events Schedule to see the rallys at which they’ll be represented. CAN I CONVERT BACK TO A TWO-WHEELER AFTER I DO A CSC TRIKE? Yes, but you won’t want to after riding such an amazing trike! Seriously though, the only items that would need to be replaced are the driveshaft & yoke, and the saddlebag subframe. All other original components will fit back on the motorcycle. DO I NEED A PARK BRAKE KIT FOR MY TRIKE ? U.S. regulations do not require a parking brake. Some other countries do require one, which is CSS offers it as an option. It is also an extra measure of security for parking a trike on steep hills. Trikes left in gear or in reverse should keep the bike stationary under most conditions. DO I NEED TO HAVE THE POWER TRAK IF I HAVE A TRIKE? Its is not mandatory, but it is recommended. Most people find that it makes the trike easier to steer and maneuver, and more comfortable for the upper body. With Voyager Standard or Voyager Classic you can go from four-wheel touring to two-wheel fun and back again – in minutes! Voyager Motorcycle Convertible kits fit most motorcycles. Voyager Motorcycle Convertible kits require no alteration to your motorcycle. Enjoy the convenience of a stabilized ride when you need it or enjoy the excitement of a 2 wheel ride in minutes. The Voyager motorcycle convertible kit lets you choose how to ride whenever you ride. Best of all, the Voyager costs less than half of most of the trike conversion kits on the market. If you already own a previous version of the Voyager in which the shocks are on the inside of the rear mud guard and you want to upgrade to the low profile back end, contact us today for a quote! Most likely. Check our Kits Available list. If your motorcycle is not on this list, that does not mean you cannot have a Voyager just yet. Just call in with the year, make and model of your motorcycle and we will (a) tell you if it is possible and (b) discuss the terms of the kit design process. HOW DOES THE VOYAGER COMPARE TO A CONVENTIONAL TRIKE KIT? The Voyager is not permanent–it leaves you the option to go back to two-wheels. You can move your Voyager from motorcycle to motorcycle (of similar size) with the purchase of new mounting hardware and suspension parts, if needed. You do not have to permanently modify your motorcycle. Plus, it saves you thousands of dollars! HOW DOES THE VOYAGER COMPARE TO OTHER CONVERTIBLE KITS? Quality. They have the strongest frame and attachment points in the industry for important reasons. The Voyager has been strenuously tested for stress levels by an independent engineering firm. The Voyager Convertible Kit is the original convertible kit since 1998. They have more satisfied customers on the road today than any other convertible kit company. They constantly improve the Voyager and have been for 13 years. Voyagers are also built to last, with a customer that has put 300,000 miles on a single Voyager using four different motorcycles!